A post-apocalyptic computer-animated action film pitting cute, ragdoll-like robots against evil, monstrous ones, Shane Acker’s 9 is all about spectacle. 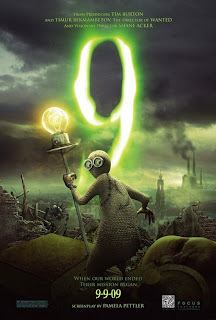 Produced by Tim Burton and Timur Bekmambetov and based on Acker’s 2005 short film of the same name, 9 has a fascinating steampunk aesthetic and moves along at a breakneck pace. However, with a brief running time of 79 minutes and a barely-there plot, 9 just doesn’t feel like a feature. And since the screenplay by Acker, Ben Gluck and Corpse Bride co-writer Pamela Pettler never gives 9’s archetypal characters anything all that interesting to do or say, this film will probably be remembered as a visually arresting yet hollow movie experience. That is, if it’s remembered at all. The verdict? It looks great, but save for some cool action sequences, 9 doesn’t offer much to latch onto from a narrative perspective. If there’s one thing that Disney/Pixar’s WALL-E taught us last summer, it’s that computer-animated robots can be more human than most flesh-and-blood Hollywood stars. Unfortunately, 9 never reaches that level of emotional engagement. But, then again, it never aspires to it. While flawed, this is a worthwhile rental.